If you’re going to keep one spice in your spice rack, it should be turmeric. It is a useful spice whether you use the root or turmeric powder. In fact, many believe turmeric is the most effective cooking spice known to man. It is even more active as a supplement. Turmeric is also called by the plant name Curcuma longa and it belongs to the same family as ginger, Zingiberaceae. The spice has been cultivated for over 5,000 years and it is native to Curcuma longasouthern India and Indonesia. Turmeric is praised in such high regard that some even refer to it as the “Queen of Spices.” The condiment has a peppery and sharp flavor to go along with its golden or saffron-like color. It is also one of 20 ingredients found in curry powder; it gives the powder its trademark yellow color. The health benefits of turmeric are also pretty incredible. Regarding its nutrient content, turmeric is a good source of dietary fiber, protein, the essential fatty acids omega-3 and omega-6, vitamin C, vitamin B3, vitamin K, folate, calcium, iron, magnesium, phosphorus, potassium, copper, zinc, manganese, and selenium. Turmeric is perhaps one of the best anticancer spices available. Studies have found that turmeric and curcumin can effectively prevent and treat various types of cancer, including colon cancer, oral cancer, mammary cancer, esophageal cancer, pancreatic cancer, breast cancer, chronic myelogenous leukemia, pancreatic cancer, and orbital pseudotumors. According to research published in the journal Anticancer Research in 2003, curcumin can suppress the onset of a tumor. It has also been found to reduce the growth, development, and spread of cancer on a molecular level. Curcumin also has a therapeutic effect in patients with monoclonal gammopathy, which is a possible precursor to the condition called multiple myeloma. Some studies have even found that turmeric can destroy the root of all cancers, cancer stem cells. Turmeric is also known to be a natural painkiller against both categories of arthritis, including osteoarthritis and rheumatoid arthritis. Osteoarthritis is the most common arthritis. The condition affects 50 million Americans, and 80% of those older than 50-years-old. Meriva is a proprietary curcumin-phosphatidylcholine phytosome complex, meaning it can help reduce joint pain. In a 2010 study published in the Alternative Medicine Review, researchers found the Meriva produced significant improvements over the control group. Other studies found that the curcumin-based supplement reduced joint pain and improved joint function. On the other hand, rheumatoid arthritis only affects two percent to three percent of the population. A 2007 study published in the International Journal of Molecular Medicine found that curcumin induced cell death and inhibited prostaglandin E (2) production in synovial fibroblasts in rheumatoid arthritis patients. Turmeric is considered useful in the treatment of diabetes by helping to control insulin levels. In a 2010 study published in Nutrition Journal, researchers found that turmeric increased postprandial serum insulin levels. The spice is also thought to improve glucose control and increase the effect of medications in diabetes treatment. Turmeric may also help lower insulin resistance, and prevent the onset of type 2 diabetes in the process. In a nine-month study published in the journal Diabetes Care in 2012, researchers found that curcumin capsules delayed the onset of type 2 diabetes in 240 people with prediabetes. Nobody taking the curcumin was diagnosed with type 2 diabetes by the end of the trial. Heart disease is considered the leading cause of death in the U.S. High cholesterol is a precursor to the development of heart disease. The curcumin in turmeric is also responsible for the heart health benefits of turmeric. In a study published in the American Journal of Cardiology in 2012, researchers found that the anti-inflammatory and antioxidant properties in curcumin reduced the likelihood of a heart attack by 65% in 121 bypass patients. Three days before surgery and five days after, half the patients took curcumin capsules or a placebo. Only 13% of the patients in the curcumin group experienced a heart attack compared to 30% in the placebo group. Turmeric contains antiviral, antibacterial, and antifungal properties, which help strengthen the immune system. Turmeric also contains the immune boosting substance called lipopolysaccharide. An overall strong immune system will reduce the chance of colds, coughs, and the flu. The antioxidant properties in turmeric such as vitamin C, selenium, and zinc, are thought to contribute to the spice’s immune system boosting abilities. Turmeric is also great for wound healing and other skin conditions. Turmeric has antibacterial and antiseptic properties; as a result, the spice is a natural disinfectant. Turmeric can especially help to speed the healing process when you have a cut or burn. Turmeric also helps repair damaged skin, and it can treat inflammatory skin conditions like psoriasis. It is a skin disorder that will produce red and inflamed patches of skin, covered with shite or silvery scales. A study published in the British Journal of Dermatology in 2000 found that curcumin suppresses the activity of phosphorylase kinase, which is related to healing psoriasis. Brain inflammation is thought to be a major cause of cognitive conditions like Alzheimer’s disease. Turmeric offers brain support by improving oxygen flow and removing plaque build-up in the brain, including preventing the build-up of protein beta-amyloid. This process may also slow or prevent the progression of Alzheimer’s disease. The curcumin in Alzheimer’s disease appears to enhance the removal of the beta-amyloid plaque in patients with Alzheimer’s disease, according to a 2006 study published in the Journal of Alzheimer’s Disease. Bisdemethoxycurcumin in turmeric root is thought to boost the immune system in Alzheimer’s patients to help remove beta-amyloid plaques. It is estimated that 10% of the American population suffers from depression. One of the main factors that helps form new connections in the brain is a type of growth hormone called brain-derived neurotrophic factor (BDNF). Major depressive disorder is a brain condition linked to lower amounts of the BDNF hormone. Turmeric on the other hand has been found to increase levels of BDNF in the brain, according to a 2006 study published in the journal Brain Research. Curcumin also been found to reverse the development of depression and enhance the outcome of antidepressant treatment in major depressive disorder, according to a randomized, double-blind study published in the Journal of Clinical Psychopharmacology in August of 2015. Turmeric is known to stimulate the gallbladder and produce bile. As a result, it helps to reduce gas and bloating. Turmeric is also the ultimate spice for improving overall digestion, especially heartburn (dyspepsia) and indigestion symptoms. It is also used to treat patients with inflammatory bowel disease, including ulcerative proctitis, ulcerative colitis, and Crohn’s disease. In a 2009 study published in the Journal of the American College of Nutrition, curcumin was part of the nutraceutical program that helped provide relief in patients with moderate to severe juvenile Crohn’s disease. Evidence suggests that turmeric protects against heavy metal toxicity, or heavy metal poisoning. It is a condition that is often undiagnosed and it is commonly detected through hair mineral analysis. In a study published in the Journal of Applied Toxicology in 2010, researchers suggested that turmeric may have a protective effect against mercury toxicity. Turmeric is also used to treat a variety of other health conditions, including liver disease, radiation-induced damage, human papillomavirus (HPV), vitiligo, premenstrual syndrome, chronic anterior uveitis, weight management, DNA damage, vertigo, gallbladder function, postoperative inflammation, fibromyalgia, ringworms, gingivitis, and bronchial asthma. Curcumin is also beneficial for the recovery of eccentric exercise-induced muscle damage. The list of turmeric health benefits is seamlessly endless. Lucky for you, I won’t let you go without the opportunity to enjoy the health benefits of turmeric. Here is a pair of great turmeric recipes. Combine all ingredients in a high-powered blender and mix until smooth. Pour the mixture into a small saucepan and heat it for about three to five minutes over medium heat. Make sure it becomes hot, but don’t let it boil. Serve the turmeric tea immediately. 3 pounds of chicken wings (about 18). Cut them at the joints and discard the tips of the wings. Put all the marinade ingredients in a blender or small food processor until everything is chopped and blended nicely. Rub the marinade onto the chicken. Pour the marinade over the wings, making sure you cover both sides of the wings. Also, save a little extra for later. Refrigerate the marinated chicken wings for an hour minimum, or overnight. Place the wings on a raised-edge baking pan, skin side down. You will likely need two pans for the meal. Bake the wings for 30 minutes. Flip and apply the extra marinade to the pan and bake for another 10 to 15 minutes, or until the wings are crispy. Garnish the wings with the chopped cilantro. Mateljan, G., The World’s Healthiest Foods: Essential Guide for the healthiest way of eating (Seattle: George Mateljan Foundation), 700-701. “Smoky Turmeric Chicken Wings,” Primally Inspired web site, http://www.primallyinspired.com/smoky-turmeric-chicken-wings/, last accessed November 16, 2015. “Turmeric Tea Golden Milk Recipe,” WellnessMama web site, http://wellnessmama.com/223/turmeric-tea-recipe/, last accessed November 16, 2015. Aggarwal, B.B., et al., “Anticancer potential of curcumin: preclinical and clinical studies,” Anticancer Research, 2003; 23(1A): 363-398. Belcaro, G., et al., “Efficacy and safety of Meriva, a curcumin-phosphatidylcholine complex, during extended administration in osteoarthritis patients,” Alternative Medicine Review: A Journal of Clinical Therapeutic, 2010; 15(4): 337-344. Park, C., et al., “Curcumin induces apoptosis and inhibits prostaglandin E (2) production in synovial fibroblasts of patients with rheumatoid arthritis,” International Journal of Molecular Medicine, 2007; 20(3): 365-372. Wickenberg, J., et al., “Effects of Curcuma longa (turmeric) on postprandial plasma glucose and insulin in healthy subjects,” Nutrition Journal, 2010; 9:43, doi: 10.1186/1475-2891-9-43. Chuengsamarn, S., et al., “Curcumin Extract for Prevention of Type 2 Diabetes,” Diabetes Care, 2012; doi: 10.2337/dc12-0116. Wongcharoen, W., et al., “Effects of curcuminoids on frequency of acture myocardial infarction after coronary artery bypass grafting,” American Journal of Cardiology, 2012; 110(1): 4044, doi: 10.1016/j.amjcard.2012.02.043. Heng, M.C., et al., “Drug-induced suppression of phosphorylase kinase activity correlates with resolution of psoriasis as assessed by clinical, histological and immunohistochemically parameters,” British Journal of Dermatology, 2000; 143(5): 937-949. Zhang, L., et al., “Curcuminoids enhance amyloid-beta uptake by macrophages of Alzheimer’s disease patients,” Journal of Alzheimer’s Disease, 2006; 10(1): 1-7. “Turmeric,” World’s Healthiest Foods web site; http://www.whfoods.com/genpage.php?tname=foodspice&dbid=78, last accessed November 16, 2015. Xu, Y., et al., “Curcumin reverses the effects of chronic stress on behaviors, the HPA axis, BDNF expression and phosphorylation of CREB,” Brain Research, 2006; 1122(1): 56-64, doi: 10.1016/j.brainres.2006.09.009. Slonim, A.E., et al., “Effect of exclusion diet with nutraceutical therapy in juvenile Crohn’s disease,” Journal of the American College of Nutrition, 2009; 28(3): 277-285. Agarwal, R., et al., “Detoxification and antioxidant effects of curcumin in rats experimentally exposed to mercury,” Journal of Applied Toxicology, 2010; 30(5): 457-468, doi: 10.1002/jat.1517. “Spices, turmeric, ground,” SELFNutritionData.com, http://nutritiondata.self.com/facts/spices-and-herbs/212/2, last accessed November 16, 2015. 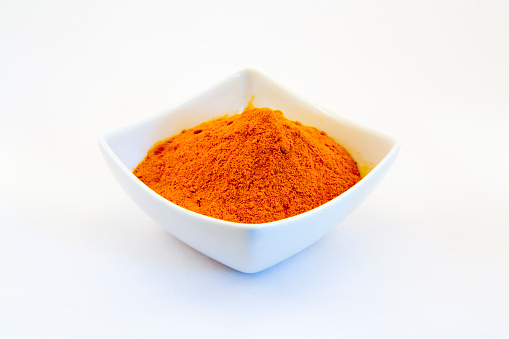 Gummars, K., et al., “10 Proven Health Benefits of Turmeric and Curcumin,” Authority Nutrition, 2014; http://authoritynutrition.com/top-10-evidence-based-health-benefits-of-turmeric/. “10 Health Benefits of Turmeric,” Top 10 Home Remedies web site, http://www.top10homeremedies.com/kitchen-ingredients/10-health-benefits-of-turmeric.html, last accessed November 16, 2015. Klein, S., “6 Health Benefits Of Turmeric,” HuffPost Healthy Living web site, October 18, 2014; http://www.huffingtonpost.com/2014/10/18/turmeric-health-benefits-curcumin_n_5978482.html.